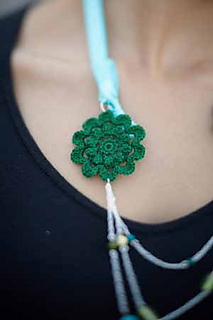 Thread crochet motifs are the focal point of this necklace and earring set. Make them in your own favorite bright colors or take them to neutral. Finished Size: About 20” long necklace, about 15/8” wide by 3½“ long earrings. Yarn: Handy Hands, Lizbeth (100% Egyptian cotton; 122 yd 112 m/0.875 oz 25 g): #638 Christmas green (A), #679 lime green (B), #665 ocean teal DK (C); 1 ball each. Hook Size: 7 (1.5 mm). Adjust hook size if necessary to obtain correct gauge. Notions: Sewing needle; fabric stiffening solution (optional); needle nose pliers; (optional) wire cutters; 24” of chain link; fourteen eye pins; four 6 mm jump rings; two 10 mm jump rings; five 6 mm beads; four 13 mm beads; two 10 mm beads; three 4 mm beads; 16” of ¼“ wide ribbon in matching color; 2 french earring hooks. Gauge: 1 zylphia motif = 2” diameter.